To fill workplace needs over the next two decades, California will need 1 million more college graduates than our education system is on track to produce. Sadly, our high school to college pipeline is broken, with too few students completing high school, enrolling in postsecondary institutions, and completing degrees. The leaks in this pipeline disproportionately hurt low-income students and students of color. California’s high schools must dramatically increase not only the number of students who are earning diplomas, but also the number of students who graduate with meaningful preparation. This means ensuring that students have the skills, knowledge, and coursework necessary for college and career. And it means eliminating the systematic tracking that exacerbates differences among student subgroups: Low-income students and students of color receive less demanding coursework, limiting the scope of both their education and their future college and career options. All California students should be well prepared for both college and the workforce. When California adopted the Common Core State Standards in 2010, it signaled a tectonic shift in the education landscape. The Next Generation Science Standards (NGSS), adopted in 2013, are a far cry from the mile-wide, inch-deep standards of yesterday. These new standards set college and career readiness as the goal for all students, and they hold the promise of bringing rigor and relevance into the classroom. To realize this promise, our state must support educators, students, and parents in every district and community as they begin implementation. Without a focus on equity during this transition period, implementation of the standards may widen existing gaps in academic access and opportunity rather than close them. To equitably implement the new standards, we must provide high-quality professional learning opportunities for all staff, provide rigorous instructional materials to classrooms, secure technology for new assessments and 21st century instruction, educate families and other stakeholders about the benefits of the new standards, and evaluate and monitor the implementation process. Taken together, these components will ensure all students in our state get access to the rigorous instruction and assessments that will prepare them for both college and career success. 1. Ensure equitable and effective implementation of the new standards, including the Common Core English-language arts (ELA) and math standards, NGSS, and English-language development (ELD) standards. 2.Expand access to high-quality instructional materials. 3. Invest in instructional models that promote deeper, interdisciplinary learning with the explicit goal of college and career success. 4. Support a transparent, swift, and equitable transition to new assessments. 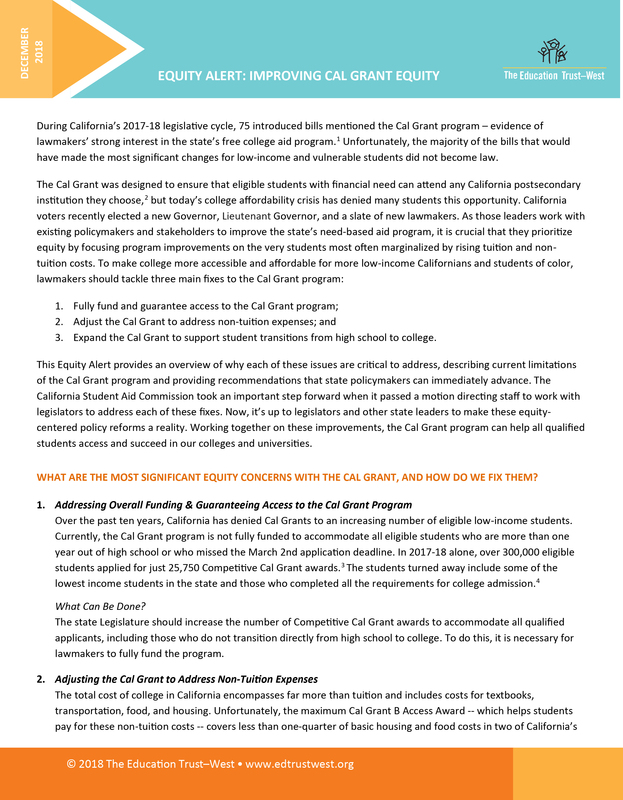 California must strengthen its graduation requirements and align them with college-ready expectations. All students ought to graduate with the courses needed to enter California’s public universities. In 20 states across the country and the District of Columbia, students are already required to complete a college-preparatory curriculum to earn a diploma, in recognition that a rigorous course of study is necessary for both college and career. Until California’s default graduation requirements are strong enough to make a student eligible for the University of California (UC) and the California State University (CSU) systems, we must continue to expand access to the “A-G” course sequence required by our state’s public university systems. Given the global economic challenges our state and nation are facing, it is abundantly clear that we must approach college and career readiness from a new direction. 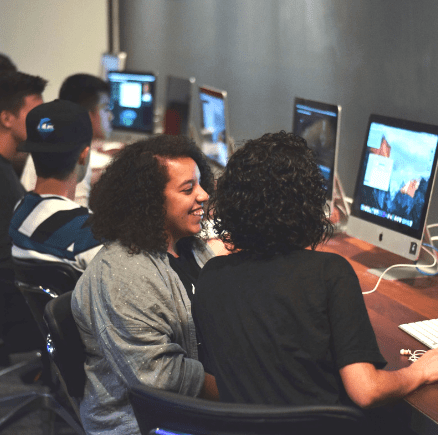 Fortunately, is a fresh groundswell of commitment to high school reform in California and across the country, with educators and policymakers committed to expanding college and career readiness. “Linked Learning” is one such effort. When implemented in fidelity with its vision, it promises to increase graduation rates and prepare students for both college and career options by offering an engaging, relevant, and rigorous course of study. The Linked Learning reform strategy is in the early stages of development and implementation in California districts. Therefore, the effectiveness, scalability, and potential of this approach to result in greater equity, improved student academic achievement, and college and career access and success has yet to be fully determined. 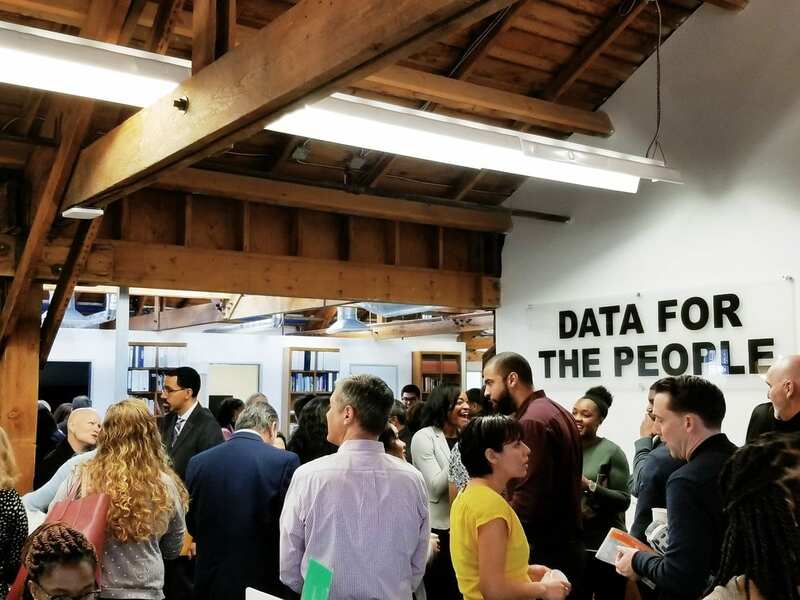 California must continue to fund, develop, and implement the state’s student data system (CALPADS) so that all stakeholders have the data they need to evaluate and support student learning and system improvement. A system that tracks individual student progress from early childhood through the K–12 system, into postsecondary education, and then into the workforce, will allow the state to determine which programs yield the most results. Further, such a system will help educators work with parents to support each student’s progress. The Education Trust—West is exploring the digital learning landscape to understand the promise and pitfalls of technological innovation in education. Our goal is to identify and advocate for the policies, solutions and strategies that will allow low-income students and students of color to fully realize the potential of the digital world and this new and more personalized approach to learning. 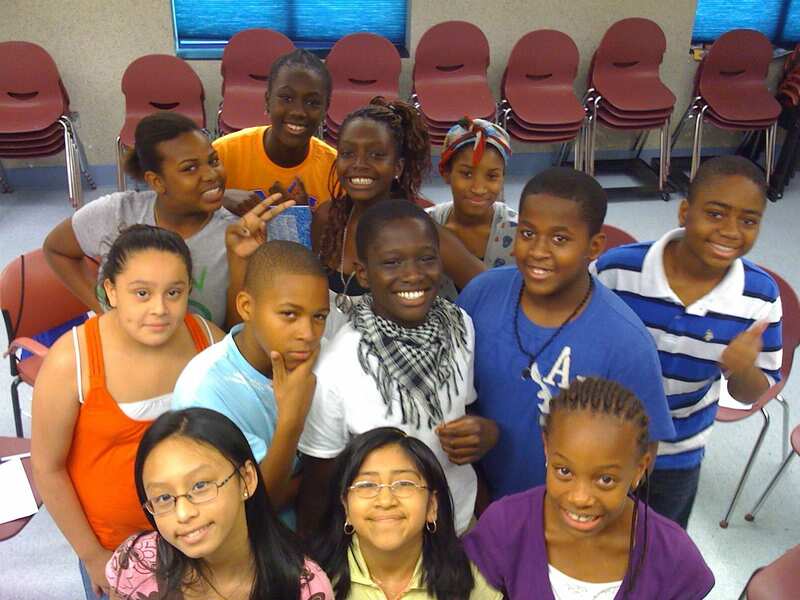 Our ultimate goal is to improve student outcomes and to erase the achievement gap. 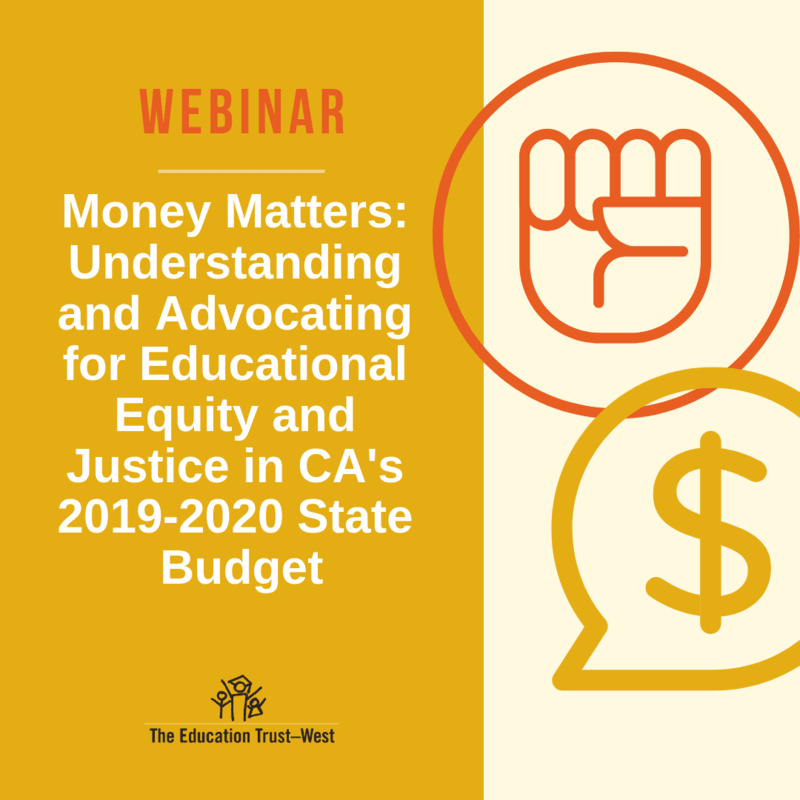 We are also concerned that low-income students and students of color lack equitable access to the benefits of technological innovation in education, and seek to ensure educators and policymakers focus on digital equity, access and success to address this inequity. 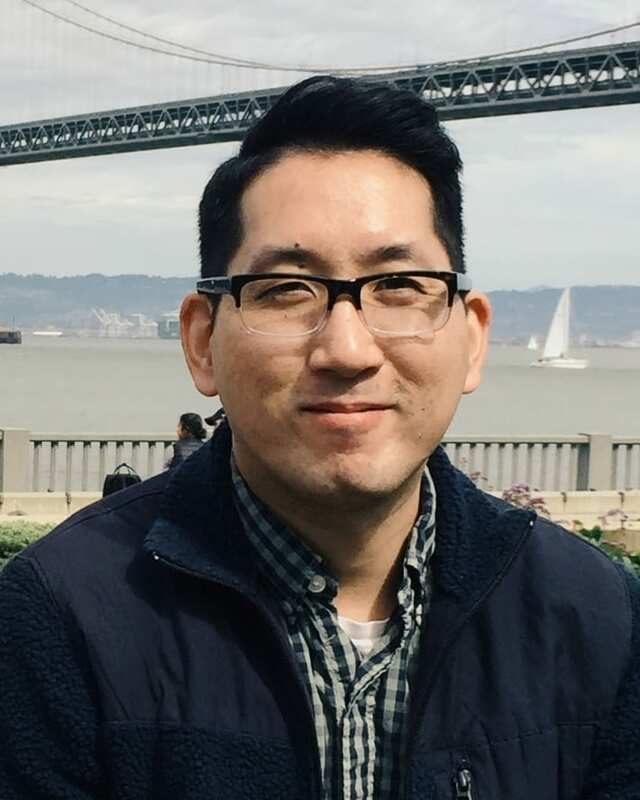 State policy and funding – removal of barriers such as seat time and other 19th century requirements and the effective use of funding to close digital divides.